Gardening as a family is fun and healthy! There's no question, playing in the dirt tops the list of fun for young children despite the protests of many well-intended parents. If you're one of those parents, you can put your fears aside. 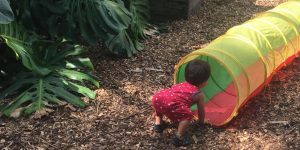 It turns out dirt is actually beneficial to the long-term health of kids, according to a Northwestern University article, “Germs at four, less inflammation at forty,”by Clare Milliken. Studies have found that early exposure to certain germs, like those found in dirt, actually help kids' immune systems learn to better regulate inflammation. In turn, this exposure reduces kids' risk for a number of diseases throughout their lives. For that reason, a family garden is a perfect opportunity to build your kids' immune systems. Better still, gardening offers lots of other benefits to kids and families. Through gardening, children learn to be responsible by caring for their own plants. It's also a great way to help them learn about and develop an appreciation for science. Another health benefit is that gardening encourages healthier eating. Not to mention, it's a great activity for family bonding. 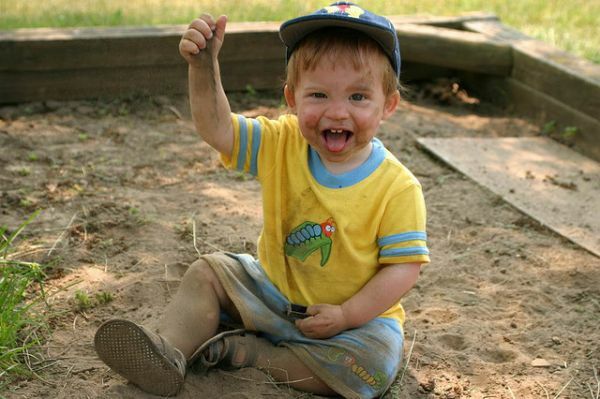 So gather up your kids and gardening supplies, head outdoors, and get ready for some dirt-filled fun. First, decide where to plant your garden. Then allot a small space for your child to have her own garden, too. This will help build their enthusiasm for the garden and encourage your child to take ownership and responsibility for it. 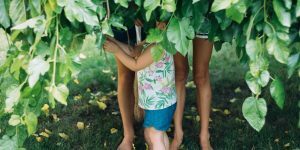 Having their own garden is especially exciting and rewarding for kids because they know that they, alone (or with minimal help), grew those little seeds into a marvelous plant. Next, decide what to plant. For young kids, consider fast-growing plants they’re already familiar with. Little kids also love plants that are colorful or have strong scents. If your kids are older, let them choose what they want to grow. Keep in mind your child's personality, though. If she tends to be impatient, suggest plants that are easy to care for and grow quickly. As you proceed in planning and preparation, include your child in it as much as possible. Remember, this stage is as much fun for kids as it is for parents and helps build kids' enthusiasm. Also, let your kids help you draw up the garden plan. If they are old enough, they can also create their own shopping list. When you go shopping for the supplies, take your kids along, and let them pick out their own seeds and gardening tools. For the safety of young children, look for kids' gardening tools made of durable plastic. When you begin planting, show your child how to plant the seeds and how to properly space them apart. Then have them water the seeds as directed. To help your child take responsibility for his own garden, put a daily gardening task list on the refrigerator. Also, to help your child maintain enthusiasm, suggest your child keep a garden log. Your child can record the date of plantings, each day's gardening activities, when each plant sprouts, the amount of growth of the plants, and the harvesting of the plants. Finally, after harvesting, have your child help you prepare the vegetables. Offer your child different ways to prepare or cook them to help them develop a life-long love for fresh, healthy veggies. Looking for local places to play in the dirt? Here are 4 places to get dirty! With activities like seed planting, arts & crafts, microscope observation, and story time, Sprouts is for kids of all ages to explore the wonderful world of the garden at their own pace. Ages18 months – 10 years old. Sing songs and read stories that promote early learning, your little one will discover the magical world of plants and insects. Afterwards, explore the rest of the gardens to see birds, find insects, and smell the flowers in bloom. Kids will enjoy story time, activities, and a healthy snack. Kids won’t want to miss this! Ages 18 months to 4 years old. Introduce your little green thumbs to the world of gardening! 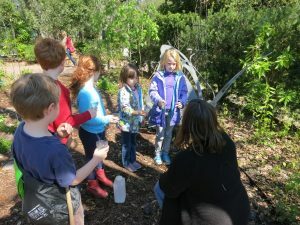 The Growing Gardeners program introduces children to the fun of gardening while learning about (and playing with!) plants, food, and ecosystems. Ages 6-9 years old.